New York's only Pete Dye design - and the luxurious Delamar Greenwich Harbor invite golfers to cast off the winter and plan for the upcoming golf season with the re-release of their popular stay-and-play experience. Ranked No. 3 in-state by GOLF Magazine and No. 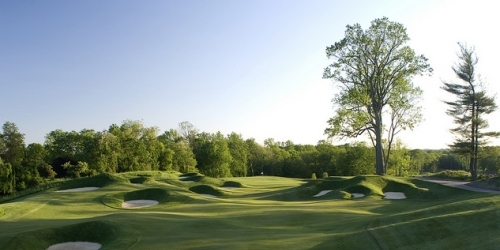 4 by Golfweek, Pound Ridge is a formidable challenge for accomplished players, with its 146 slope and 76.1 course rating from the back tees. However, Dye's use of handicap differential in determining the placement of the five other sets of tees makes the golf course appealing for every type of player. The Delamar Greenwich Harbor features 82 deluxe rooms and suites with 500-feet of waterfront and private docks. Designed to evoke old world charm, it houses a full service spa with services and treatments by the luxury brands Biologique Recherche and Valmont, and an award-winning restaurant and bar, L'escale. Wrought iron balconies, marble bathrooms and working fireplaces grace the guest rooms of this Mediterranean-inspired "inn." Guests enjoy tee time booking via concierge or hotel staff and transportation options (from shuttles to rental cars and limousines). Pound Ridge Golf Club reserves the right to change price and offer at anytime. Prices and offer are subject to change without notice. NYGolf.com is not responsible for errors posted in this golf package.